Until Jeanne-Claude’s death in 2009, they were a couple creating some of the most controversial art to be seen in modern times by wrapping important landmarks in enormous amounts of fabric. Bulgarian Christo (Christo Vladimirov Javacheff) and French Jeanne-Claude (Jeanne-Claude Denat de Guillebon) were born on the same day in the same year (13.6.1935) and first met in 1958 in Paris. Until 1994 all their works were solely credited to “Christo”. 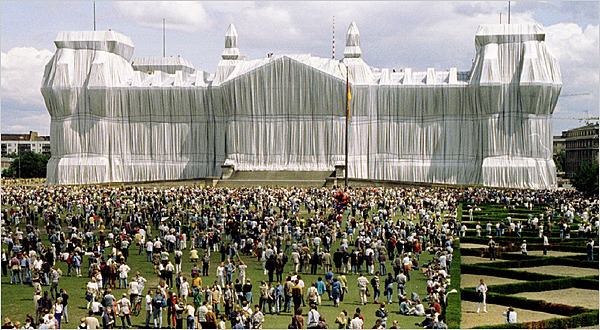 As of 1994 their outdoor and large indoor installations were retroactively credited to “Christo and Jeanne-Claude”. Their commitment and united approach to their art meant that they travelled on separate airplanes: in case one crashed, the other could continue the work! In 2009 Jeanne-Claude died from the complications of a brain aneurysm. In 2013 the Oberhausen Gasometer, which we visit on our Sidetracks Western Contrasts Tour will host Christo and his “Big Air Package” and showcase some of the most important Christo and Jeanne-Claude projects. Gas holders, also known as gasometers or gas bells, are a common sight in areas of gas production or use. 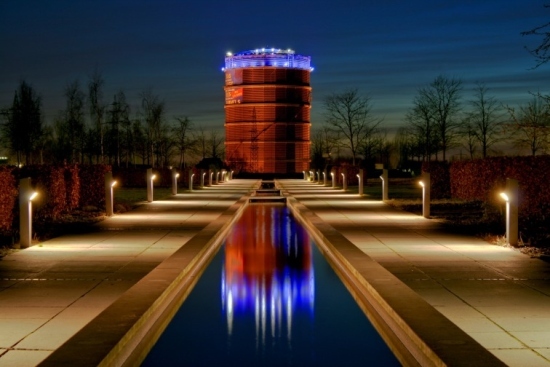 The Wikipedia entry has a lot of technical details for those wanting more information, but suffice it to say that some gas holders are still in use today. Not so much for storing gas as having gas online, city mains supply, always at the right pressure. For those structures that have been decommissioned, the issue of contaminated grounds has been critical for any conversions. Those that are deemed safe are turned into exhibition spaces – such as the one you’re about to visit on your Western Contrasts Tour in Oberhausen – event centres, living quarters and even a shopping mall! 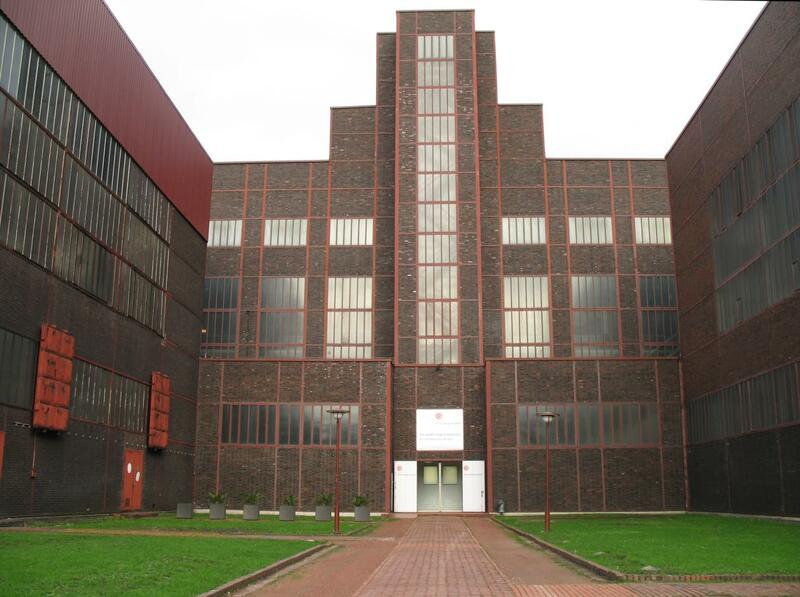 Oberhausen is home to the tallest one in Europe at 117.5m high and has been open for exhibitions since 1994. Even though the exhibition space is restricted to the bottom 4.5 meters of the building, the rest of the structure can be explored via a glass panorama lift, lifts and stairs leading to the top. From up there a unique panoramic view of the whole of the western river Ruhr can be enjoyed which, during clear weather, extends over 35 kilometres. The beginnings of the museum can be traced back to 1860 when a regional mining company set up a permanent exhibition mainly for training purposes. At the end of the 1920’s this concept was further developed to become a public exhibition. Due to major bombings in WWII the unfinished buildings needed to be rebuilt and extended in the second half of the 20th century. The 12,000 sqm large exhibition space offers a chronological display of the technological and sociological development of mining from prehistoric to modern times. 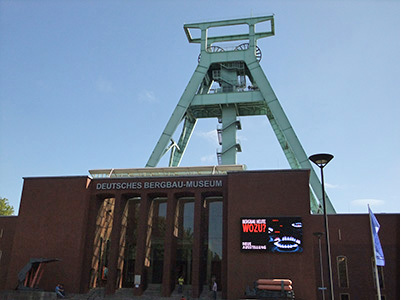 In addition to exhibits and models it features a 2.5 km long visitors mine. Even though it had never been used for mining it demonstrates a lot of technical aspects, which would not always be accessible in a real mine. As the permanent exhibitions focus more on the general developments, the temporary ones offer detailed insights into regional and international mining histories and events. For example mining disasters, painters depicting mining culture, tunnel projects and copper mining in Chile. Enjoy your guided tour underground on our Western Contrasts Tour in the knowledge of a safe return to daylight! 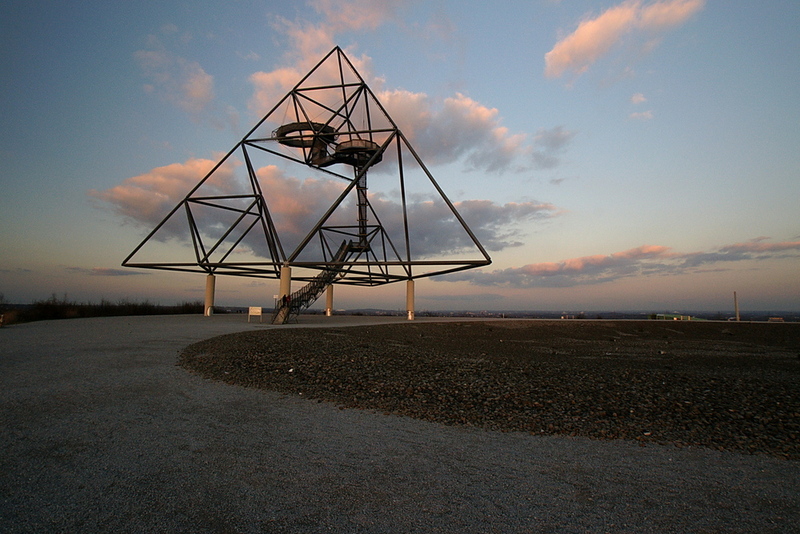 The Tetraeder Halde, or the official names ‘Halde Beckstrasse’ or ‘Haldenereignis Emscherblick’ (mine dump event with view of the Emscher region), is a fascinating example of the changes occurring in the Ruhr Gebiet (region): abandoned coal mines are being converted into landmarks, activity centres and historical monuments documenting the region’s industrial background. It is a beam construction in the shape of a three sided pyramid made out of steel beams sitting on top of concrete pillars. As this is a classic gem only known to regional guides, all info about it is in German. But this site has some stunning photos to give you an idea what’s in store and what to look out for. 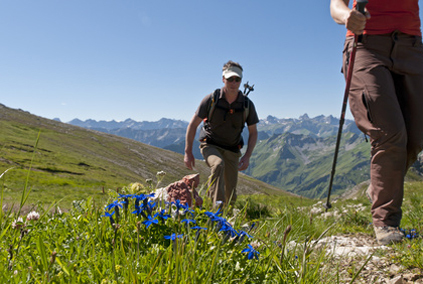 On your Sidetracks Western Contrasts Tour your bilingual guide will be of assistance. The whole construction can be explored – for those not suffering from vertigo or fears of heights or swaying platforms that is. The top of the mount has been designed as a lens shaped hollow. As one moves into it, the surrounding landscape disappears and one is alone under the sky, with the construction and the black rocks, from deep down the mountain (1200m), reminding us of the mount’s history. The city is situated along the river Ruhr in the largest urban agglomeration in Germany called the Ruhrgebiet (Ruhr region), or more colloquial Ruhrpott, Pott or Revier, which all refer to its history of coal mining and steel production. Even though the origin of the name Essen is disputed (it definitely has nothing to do with the modern word for food or eating, which is spelled the same), its existence in one form or another can be traced back 280 – 250,000 years back. A few artefacts from the Stone Age have been found as well, but as the land was heavily utilised during the Industrial Age, and archaeological practices were not observed at that time yet, most evidence would have been destroyed during the mining for coal. As time passed, buildings got more substantial and therefore had more of a chance of remains surviving. 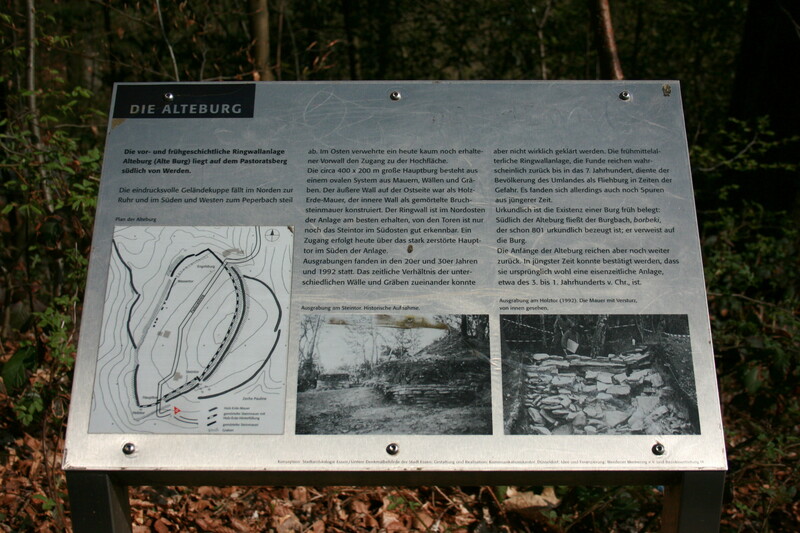 For example the Alteburg castle in the south of Essen can be dated back to the 1st or 2nd century BC. Up to the 17th century Essen’s historical relevance was of religious nature, which started to change in the middle of the 14th century when the reigning abbess was granted silver mining rights. Coal mining existed already as well, but began in earnest around 1450. By the end of the 16th century Essen had many coal mines and had established itself as a centre for the weapons industry. The Krupp dynasty had lived in the region since the 16th century. Their and the city’s efforts shaped each others history. In 1811, Friedrich Krupp founded Germany’s first cast-steel factory in Essen and laid the cornerstone for what was to be the largest enterprise in Europe for a couple of decades. The weapon factories in Essen became so important that a sign facing the main railway station welcomed visitor Benito Mussolini to the “Armoury of the Reich” in 1937. The Krupp Works also were the main reason for the large population growth beginning in the mid-19th century. After WWII, during which Essen was heavily bombarded and destroyed, the manufacture of weapons ceased. But some of the larger old industrial enterprises continue to be the main employers in the region. Due to economic changes in the 1970’s, the city has developed a strong tertiary sector of the economy. As with all major economic changes, it took a while and a lot of hardship to establish and foster new industries. Nowadays Essen is a vibrant city with lots of businesses located there and the Arts alive and well in the region. 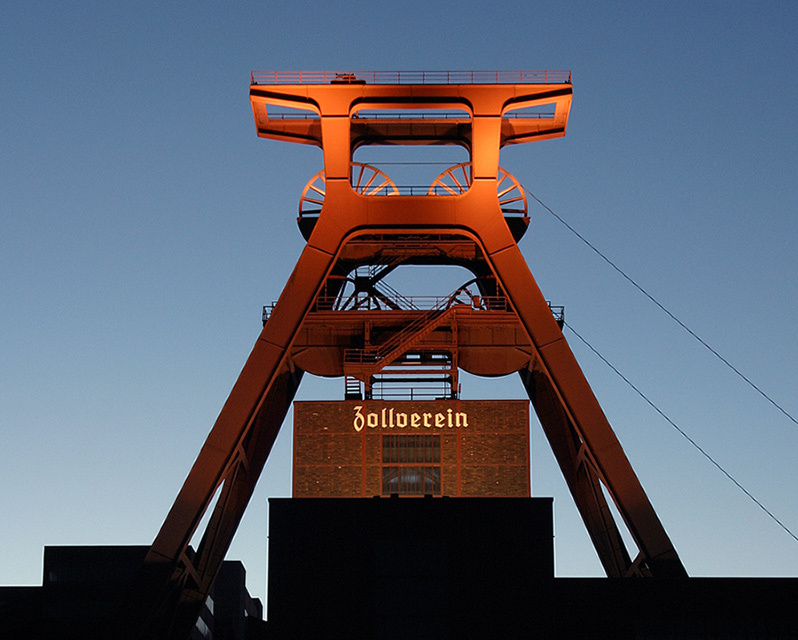 On the Sidetracks Western Contrasts Tour we visit two impressive landmarks of the Essen region, the Tetraeder Halde Monument and the Zollverein Coal Mine Complex, both offering amazing insights into Germany’s Industrial Heritage. Paying homage to its history, a lot of art and activities in the region are housed or happening in old mining buildings. Visiting the mines during your stay in Essen during the Sidetracks Western Contrasts Tour, you will be able to experience the amazing architecture prevalent at the construction periods. One of them is the Zollverein Coal Mine Complex which is one of the major sites on the European Route of Industrial Heritage. The mine was founded in 1847 by Franz Haniel and mining started in 1851. By 1890 he had built two more shafts. The production of 1 million tons of coal by the three shafts made it the main producer in Germany. As the coal, iron and steel industry flourished, the mine extended in the following decades and culminated in the installation of Schacht Albert Vögler, shaft12, in 1932. This one was designed by Fritz Schupp and Martin Kremmer and gained fame for its Bauhaus style. As you will see during your guided tour, the space of the former boiler house is now inhabited by another leading design organization: red dot design museum. But the tour will not only focus on the design and architecture of the mine, but also the technological features and changes of it during its lifetime. Also, the impact of economic changes, ups and downs, on the region will be talked about in more detail. What a bizarre title you might rightly exclaim! Wait til you will see a picture of what this is about. While pondering past hiking tours a memory resurfaced: when we were children, as a reward after a successful hike, we would buy a medallion showing a favourite view or landmark of the park we had just wandered through and nail it to our walking sticks. Researching the German term and looking for pictures this delightful blog appeared, where this picture comes from. If on your travels through Europe with Sidetracks Tours you worry what kind of souvenir to take home, because you’re bored with postcards, or want something different, consider these little gems. 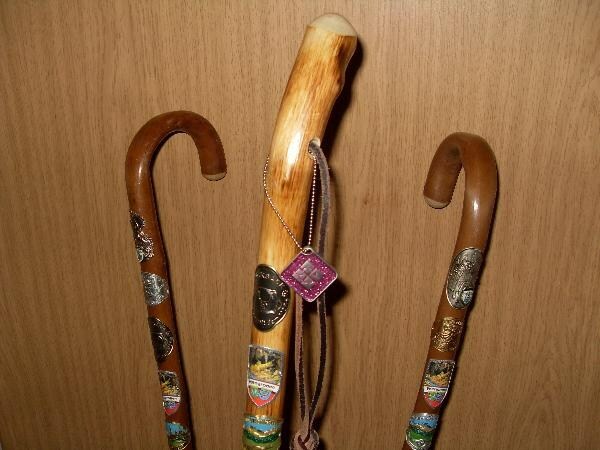 They’re a variation on the collectible tea spoons, but nailed to a ‘practical’ walking stick less intrusive. Not too sure about buying a traditional wooden walking stick though, you might have problems getting it back home on the plane. Also, these little medallions take up less space than books or t-shirts and will show everyone: Been there, done that, didn’t get the t-shirt but the nail instead.